“You’re white and you’re black. How does that happen?” Oh boy. Jordan, who has dealt with this question before, ultimately answered by saying that there is actually a multitude of ways this could happen — like what if they (Sue Storm and Johnny Storm) were raised as brother and sister? “There’s a whole bunch of different family dynamics there can be without the obvious adoption,” he said. When the group was done talking about the sibling thing, the interviewers began to comment on Mara’s hair length: “You’re way, way hot. Why’d you cut the hair?” Oh. Thinking this might be weird, there are a few jokes tossed about Mara being uncomfortable. But then, out of nowhere, thankfully a natural Romeo comes to save the interview: “I’m a toe guy. … Your toes are fine.” Oh. Look, not a huge fan of these controlled 5-7 minute interview junkets they run in the first place but I was curious about the brother and sister thing. You have a white sister and black brother wouldn’t you want to know how that happened? I did. 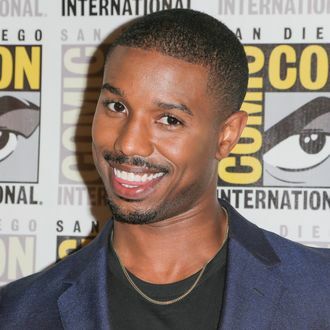 … My partner’s (Southside Steve) conversation about Kate’s hair is something that came up while Michael B Jordan took a phone call so I think they were kind of just going back forth in a playful way. As for him complimenting her toes and why people are upset about that…sorry…no idea. Steve likes girl’s toes. People should be appreciative when they get complimented. Good to know. No. Ban stupid questions about hair and skin color, ban toe compliments.